Describe what makes Smitten Ice Cream unique. Robyn Sue Fisher: The freshest, purest, creamiest ice cream made on demand just for you. What is your earliest ice cream memory? Brooke Mosley: Stirring burgundy cherry ice cream in a bowl in the backseat of our rusty orange Volvo station wagon, while side-eyeing my brother scarfing his down, only beginning to eat (and gloat) once he was finished. RSF: Oh man, so hard! I have two tummies, with one solely reserved for ice cream, so the memories pile up! I remember when I was about 3 and it was sooooo hot (in Boston) that I was sitting on the front steps of our house, basically naked, with my brothers, eating ice cream soup! What is Smitten’s most popular flavor? BM: Our Cookie Dough with pretzels and chocolate chips straight up crushes the others. BM + RSF: Watermelon Cream! What is the most unique flavor you’ve offered? BM: Pineapple Upside Down Cake or Bee Sting. Is there a flavor you love(d) that didn’t find an audience? BM: Passion Fruit and Browned Butter Dates. I die for it, but it wasn’t intuitively delicious to everyone. BM: Humans. Always humans. How we connect, how we miss, where we find each other, where we lose each other. Understanding the different types of love. Understanding the different types of broken hearts. There is an ice cream for every emotion. I’m sure of it. RSF: Nature! I love going for a run or walk through the woods, smelling the smells and hearing the sounds—stepping back from the noise and just letting my senses lead the way. BM: I fell in love with a Paco Jet at Grace restaurant in L.A. in 2004. And specifically a brown sugar flavor, laced with nutmeg that we made with it. Lokelani Alabanza of Hattie Jane’s in Tennessee taught me how to use it! RSF: Honestly, I felt like ice cream needed a makeover. So much of it is made for shelf life, and I wanted to figure out how to make ice cream a fresh product for everyone. Why? Because fresh food just tastes BETTER (and is better for the world). 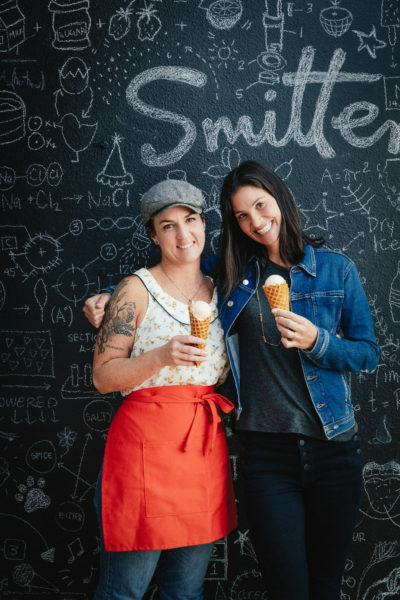 So, I dove into the idea of “Smitten”—ice cream made on-demand, fresh as can possibly be, clean and pure, wholesome and intensely flavorful. How did you learn to make ice cream? BM: As a kid. Hand crank. The whole bit. Maybe at 7 years old. Obsessed ever since. RSF: I learned by inventing our Brrr machine—for real. We make ice cream in approximately 90 seconds due to the magic (and nerdiness) of our Brrr machine, which was my first child in a lot of ways :). I learned to make ice cream by figuring out how to perfect the art of freezing ice cream on demand. What is the secret to scooping ice cream? RSF: With our Brrr machine and our super smooth texture, scooping is a cinch! BM: Cup. No toppings. Good ice cream should be able to own the room she’s in. What is your topping of choice? RSF: Something salty and something sweet! A surprising thing you’ve learned about ice cream? RSF: It’s a darn good breakfast! Best advice you can share for those who want to get into the biz? BM: As with anything, always for love, never for profit. RSF: Get to know the market. Any industry mentor or person who inspires you? BM: Not a mentor, sadly—but Brooks Headley rocks my world. If we all would just stay true. To the food, ourselves, and each other. There’d be a lot more joy in this world. Advice for making ice cream at home? BM: Keep it simple. Use real ingredients. Support your local farmers and dairies! RSF: Use the good stuff and make sure you have enough fat in there. Guess who is in our California Girls issue! Robyn! Don’t miss it.